The Dane County Sheriff’s office says a gas line explosion occurred in Sun Prairie on Bristol Street Tuesday. Authorities said the gas lines were turned off later Tuesday night. 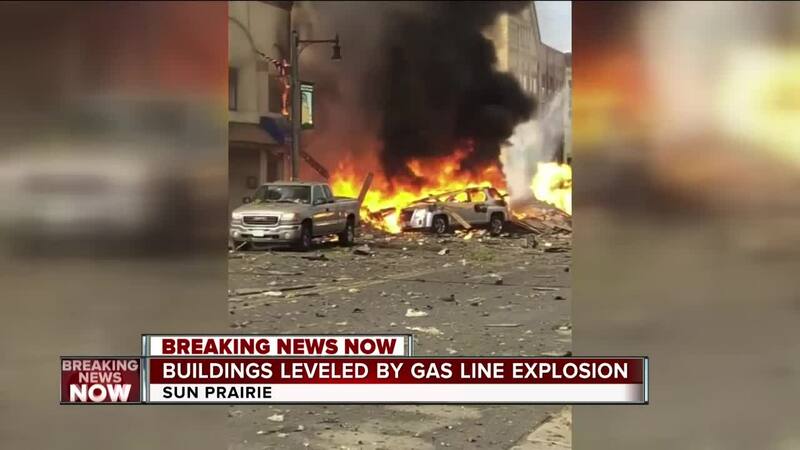 Dane County Sheriff's Department operations manager Paul Logan says people were hurt in the explosion Tuesday evening in Sun Prairie, which has about 30,000 people. Two firefighters were hospitalized in the incident. A police officer was injured and treated at the scene, along with some civilians who were also treated with minor injuries. No deaths were confirmed, and no one has been reported missing. A search and rescue effort is planned after the fires are put out. The investigation is being handled by the fire department, and no criminal activity is suspected. According to our sister station WISC-TV , the sheriff said several buildings were leveled. Residences within a five-block radius have been evacuated. Witnesses heard a large boom around 7:15 p.m., and a massive plume of smoke rose from the downtown area. We Energies told TODAY'S TMJ4 it was made aware of a contractor hitting a gas main in Sun Prairie. We Energies sent a response crew to the area to turn off the gas. The contractor was not working for We Energies but struck a We Energies gas line. Firefighters from Sun Prairie and surrounding communities responded to the scene. Police blocked off downtown streets from traffic and onlookers. The area has several businesses including bars and restaurants. Steve Owen, 60, who owns Sun City Cyclery and Skates in downtown Sun Prairie, said he saw firefighters and police officers on the street and then the explosion happened. He said the building across from his shop "literally lifted up." People were scrambling," said Owen, who lives above his shop. Jill Thompson, 56, who lives about two blocks from where the blast occurred, said, "It shook the whole building. I thought someone had hit the building with their vehicle. We seen the smoke immediately." The area is about half a block from City Hall.